Implementing frequency response using grid-connected inverters is one of the popular alternatives to mitigate the dynamic degradation experienced in low inertia power systems. However, such solution faces several challenges as inverters do not intrinsically possess the natural response to power fluctuations that synchronous generators have. Thus, to synthetically generate "virtual" inertia, inverters need to take frequency measurements, which are usually noisy, and subsequently make changes in the output power, which is therefore delayed. As a result, it is not a priori clear the whether virtual inertia will indeed mitigate the degradation, or some alternative control strategy will be necessary. In this talk, we present a comprehensive analysis and design framework that provides the tools required to answer this question. First, we develop novel stability analysis tools for power systems, which allows for the decentralized design of inverter-based controllers. The method requires that each inverter satisfies a standard H-infinity design requirement that depends on the dynamics of the components and inverters at each bus, and the aggregate susceptance of the transmission lines connected to it. It is robust to network and delay uncertainty, and when no network information is available reduces to the standard passivity condition for stability. Second, by selecting relevant performance outputs and signal norms, we define system-wide performance metrics that explicitly quantify the effect of frequency measurements noise and power disturbances on the overall system performance. Using a novel modal decomposition, we derive closed-form expressions for system performance that explicitly capture the impact of network topology, generator and inverter control parameters, and machine rating heterogeneity. Finally, we leverage this framework to design a new dynamic droop control (iDroop) mechanism for grid-connected inverters that exploits classical lead/lag compensation to outperform standard droop control and virtual inertia alternatives in both joint noise and disturbance mitigation and delay robustness. Enrique Mallada is an assistant professor of electrical and computer engineering at Johns Hopkins University. Before joining Hopkins in 2016, he was a post-doctoral fellow at the Center for the Mathematics of Information at the California Institute of Technology from 2014 to 2016. He received his Ingeniero en Telecomunicaciones (telecommunications engineering) degree from Universidad ORT, Uruguay, in 2005 and his Ph.D. degree in electrical and computer engineering with a minor in applied mathematics from Cornell University in 2014. 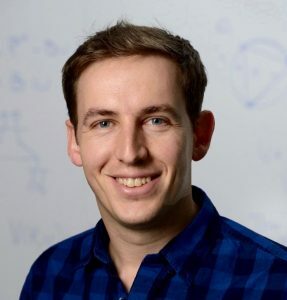 Prof. Mallada was awarded the NSF CAREER award in 2018, the ECE Director's Ph.D. Thesis Research Award for his dissertation in 2014, the Cornell University's Jacobs Fellowship in 2011 and the Organization of American States scholarship from 2008 to 2010. His research interests lie in the areas of control, networked dynamics, and optimization, with applications to engineering networks such as power systems and the Internet.